Let the countdown 'til Christmas begin with DAY 1! The holidays are here! Is there a better way to kick off Cowabunga Christmas than by playing with toys?! Looking at the countless action figures in my TMNT collection, there are some really wild and absurd creations. But alas, there are no holiday-themed toys. What a missed opportunity! Who wouldn't want a Santa Splinter, Rudolph Raphael, or Kwanzaa Krang resting on their mantel come December? Heck, they could even make an entire Hanukkah In A Halfshell line. Everyone would drop the cash for festive figures like that. Here's where The Sewer Den comes to the rescue. 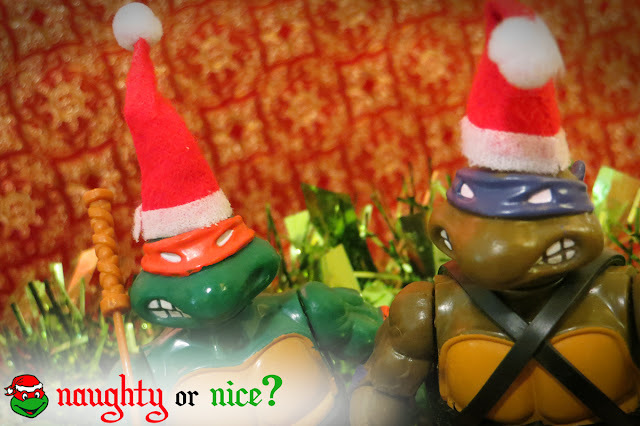 For a lousy buck, I created my very own TMNT holiday toys. A simple craft decoration will mutate your figures into the Santas of the sewer. The best part of forging your own Holiday Action Figures? YOU select the era of TMNT to put on display. For me, I opted to keep it classic. Like "Jingle Bells" or a traditional Santa Claus, these figures from the 80s never go out of style. Do the Holiday Action Figures make for a good gift? Well, that depends how deep your pockets go. Buying only the accessories (like the hats) and giving that alone is a pretty weak gift. 4 hats for a dollar? You can do better than that. 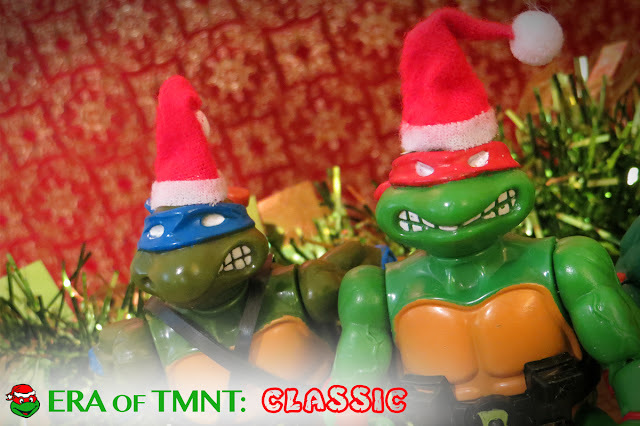 Toss in a couple of TMNT figures along with the festive accessories and you've become the ultimate Santa Claus. 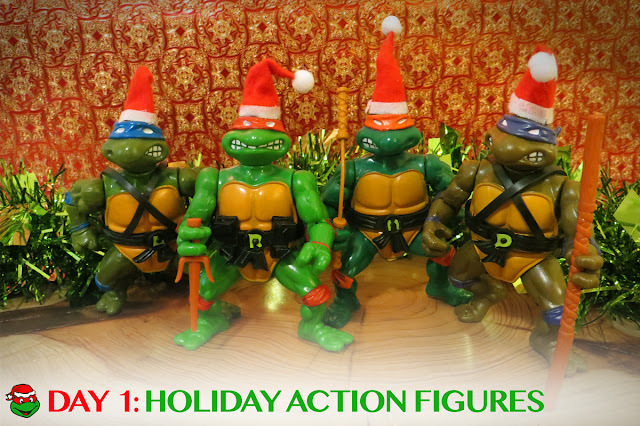 Custom TMNT Holiday Action Figures are gift that will make everyone shout "cowabunga." 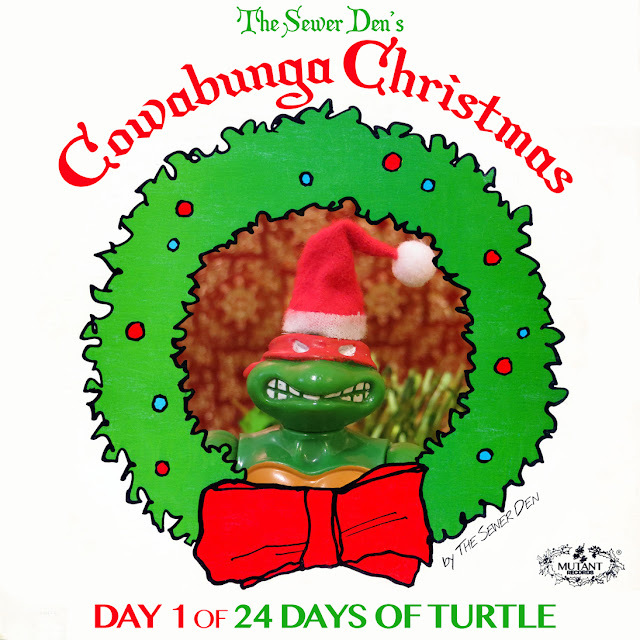 Check back tomorrow for DAY 2 of Cowabunga Christmas! Can't wait until then? Take a trip with the Ghost from Christmas Past to see what The Sewer Den put on display on December 1st in 2013 and 2014. Those look great, I found the same ones, as well as a full Santa outfit, that is a bit small for the Turtles unfortunately. Can't wait to see all you have in store for us this year. I have a tree that goes with them too, but forget that during the photo shoot. Maybe next year. And a Santa outfit?! That would blow my mind. Ooh..where are you guys finding those Santa hats? Dollar Tree? AC Moore. 4 for a $1. Heroic prices!